Everyone has heard of Russian mail order brides right? Get mailed a pamphlet of girls, mail the ones you like a letter, get a letter in return, then get married. In modern times foreign men meeting single Russian women on Russian Cupid makes a whole lot more sense. There are still many beautiful Russian women out there that want to meet a guy from another country. Many would love to a more prosperous country and try to live a better life. Other Russian women might just want to take things more casual and hang out with guys that are in town, be it foreign men or Russian guys. Whatever the case may be Russian Cupid is a great way to make a whole lot of contacts in a short amount of time. There are going to be a few pitfalls to this that can be hard to overcome. First off you kind of do need to be in Russia or take a trip there. Depending on where you are reading this from that could be very far away. Secondly, the language barrier is going to be a real thing. We are guessing that most guys reading this right now aren’t too great at speaking Russian, maybe we are wrong on that. The two main places that most guys go on a trip to Russia are Moscow and Saint Petersburg. Click on those links and you can read some good date options on either. But for now lets focus on the reasons to use the best Russian dating site. When you learned a foreign language in school growing up what did you do in class? Mostly paperwork right? Well that is how Russian women learn English also. Learn what the words mean but spend very little time having conversations in English. This can actually be great if you meet an intermediate level English speaker that wants to practice with you. But there are few of them around. More likely most women you approach around town are not going to speak English well at all. That means if you walk up to them and try to start up a conversation they may shun you even if they have some interest. If you want to learn some Russian then that is a moot point, but are you really going to learn it to a conversational level? Or are you just going to figure out how to ask where the bathroom is? Day game is always going to be hard if you don’t know how to speak a common language. Meeting single ladies in the nightlife can be a bit easier, but women here generally aren’t up for one night stands. They have been known to happen, but they shouldn’t be expected. So you are going to have to spend your first few nights in town making contacts at bars and nightclubs, then hoping to get dates from them on your last days in town. This can work, but why not meet single women seeking foreign men before you even fly over? Why wait until you arrive in town to start making contacts if you don’t have to do so? Why not start meeting them before you arrive? That way your first night can be spent on a date, not trying to get future dates? And how many numbers can you actually get on a night out? 5? 10? You can get that many numbers in 5 minutes on Russian Cupid. If you spend an hour pipelining before you show up you can have a full dance card for your first nights in town. Remember women are flaky, a drunk woman giving you her number at a nightclub might never reply when you text her. The same can be true of a girl from a Russian dating site, but if you have 50 numbers you are going to be getting replies. Remember these girls aren’t really up for one night stands generally. Two or three dates are going to be needed to score, if night 1 is used on meeting them are you really sure you can get 2 or 3 more dates out of them before you leave town? Speed up the process. And that is just talking about finding some Russian women interested in foreign men to have fun with when you are in town. What if you are looking for a serious girlfriend or wife. Do you want to go to a bar and choose from one of the few women there who gives you her number? Or do you want to meet hundreds online and be able to pick and choose the women that you get along with best? Everything in life is a numbers game to some extent. The more times you try at something the higher your chances are at success. If you can make contact with 100 single women in an hour instead of 5 in a full night why wouldn’t you want to do that? Many years ago online dating had a bit of a stigma to it. These days the younger generations think online dating is the way to go and picking up barflies carries the stigma. 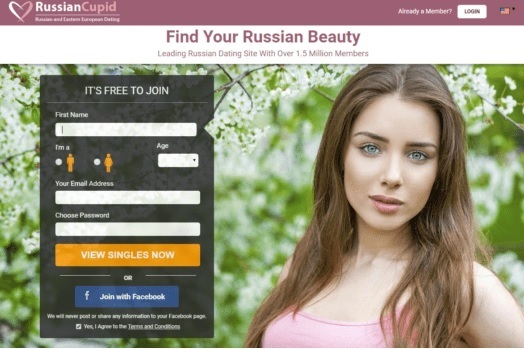 The nice thing about Russian Cupid is that you can sign up for free and take a look. If you live here or are going to fly over then search in the cities you plan to visit. If you don’t have any plans yet and are more flexible then you can just check them all out. If you like what you see from the available single Russian women interested in foreign men on the dating site then go ahead and sign up. If you don’t then it didn’t cost you anything to give it a look. The internet has made the world a much smaller place and that is a good thing. 30 years ago your only chance to make contact with a woman here would be to either fly over and hope or trust some mail order bride service. Neither seem like very good plans. Now that meeting single Russian women online on Russian Cupid is possible for foreign men you have a lot more control over the outcome.